Mammoth Lakes – What is it about the peaks and vistas of California’s High Sierra that would draw well known Palm Springs and Death Valley desert photographer and painter Stephen H. Willard to spend the predominance of his early 20th century career (spring till fall – 1923 till 1966) working from a high mountain cabin/studio in the Eastern Sierra instead of continuing to wander the desert trails for which he had gained national attention? The answer to that question may be answered this year, as a new generation of desert painters begin their quest for inspiration in the mountains of Willard’s Eastern Sierra. 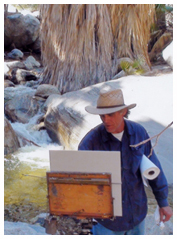 Well known Palm Springs landscape painter Terry Masters (Whose work can be found at DesertPainter.com) will spend the first two weeks of August 2014 retracing Willard’s footprints from the same cabin/studio that Willard built as his mountain home near Mammoth Lakes in 1923. 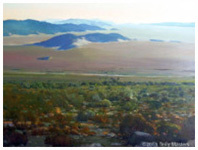 Terry is an award winning landscape painter who specializes in the deserts and vistas of Southern California. The Stephen H. Willard Studio, now known as The Gallery at Twin Lakes will host Mr. Masters visit as part of their recently established Artist-In-Residence Program. Using Willard’s cabin as a home base, Terry will be joined by other painters, photographers, musicians, writers etc., as they search to find the inspiration that drew Willard, along with many other historic artists into California’s Eastern Sierra so many years ago. To view Terry’s work as it progresses, or to join in the artistic adventure yourself during those first two weeks of August 2014, visit The Gallery at Twin Lakes – 51 Lake Mary Rd, Mammoth Lakes, CA or call us at 760-924-7300 for more details. 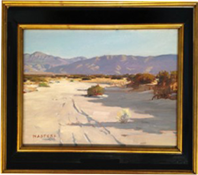 Terry Masters is an award winning landscape painter who specializes in the deserts and vistas of Southern California. In 2002, Masters was awarded 1st Place in the City of Palm Springs Art Competition, and again in 2003, he won 1st Place it’s Juried Art Exhibition. He has participated in the La Quinta Arts Festival, and the Desert Plein-Art Competition. 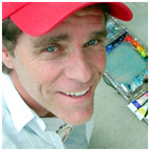 In 1996, he received the Larry Sitter Memorial Award for best desert painting at the Riverside County Fair, and in 2011 was awarded 1st Place in the Balboa Island Huse Gallery Plein Air Invitational. Terry has lived in Palm Springs for many years, and has taught painting classes at the Desert Art Center, The Palm Springs Art Museum, as well as many workshops in California. He is co-founder of the desert chapter of the California Art Club, and a member of the Laguna Plein Air Painters Association. His name is found in many reference books documenting noted California painters. Terry was raised in the Coachella Valley and has a deep appreciation for the beauty found in the light of the desert. Having spent his youth exploring the desert’s canyons and vistas has given Terry an in-depth knowledge of the many places that lend themselves to being painted in the manner that he is so well known for. Born in Sacramento in 1955, Terry was one of nine children. The family moved to Palm Springs in 1967. Terry had a successful career as a KPSI radio station announcer and manager for 21 years. But all the time he was working in radio, his destiny was really his art. He was primed to be an artist by his junior high and high school art classes, as well as the Paul Grimm paintings he admired in Palm Springs’ shop windows as a boy. He would look at them and think: “Man, someday….” At the same time, he was discovering the desert terrain that would be his prized subject. Coming from Sacramento, where the horizon was flat, the young Terry especially adored the perspective from the peaks: “I just loved getting up high to look all the way down the Valley and over the little San Bernardinos.” The plein air painting craze of the 1950s and ‘60s had gone by that time, and Terry never saw anyone painting outdoors. He didn’t know it then, but he would play a major role in reviving the venerable tradition. Masters credits his workshops and fellow painters for his current level of accomplishment in oil painting. Ken Auster, the great Laguna painter gave him his first instruction in painting “en plein aire”. Other painters he credits with helping him along the way include Robin Hall, Jason Situ, Michael Situ, Scott Prior, Debra Huse, Russell Case, Daniel Gerhartz, Jeremy Lipking, Glen Dean, Mark Kerckhoff, Matt Smith, John Budicin, Elaine Mathews, Mehdi Fallahian, Gregory Hull, Carole Cooke, and Albert Handell. Painters of influence include Paul Grimm, M.C. Escher, Maxfield Parrish, John Singer Sargeant, Joaquin Sorolla, Edgar Payne and the early California painters, Maynard Dixon, Nicholi Fechin and the Taos groups, Clyde Aspevig, Daniel Gerhartz and Mark Kerckhoff.